This is not the sort of book I usually read, and if it had not been for my little book club I probably would have never read it. 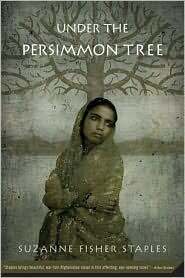 That being said, I really enjoyed Under the Persimmon Tree by Suzanne Fisher Staples. It’s the story of a family, in particular a young girl named Najmah, in Afghanistan in 2001. She witnesses the Taliban kidnap her father and brother, and her mother and baby brother killed by an American bombing. Her home and village are decimated and she begins a journey to a refugee camp in Pakistan to try to find what is left of her family. Her journey is long and dangerous and she sees indescribable horrors. Once in Pakistan she is placed with an American woman, Nusrat, who teaches refugee children under a persimmon tree in her yard while she waits for her husband to return from a clinic he opened to help the people of his homeland. Najmah grows immensely while in the care of Nusrat and learns everything she can, even English. Nusrat is given hope by this girl after waiting for months with no word from her husband, and hides Najmah when her uncle comes looking to take her back to their village so he can force her to marry and take his brother's property. Eventually Nusrat comes to the realization and accepts that her husband has been killed. She wants Najmah to go back to America with her. Najmah will not hear of it and still holds out hope that she can find her father and brother and makes no qualms about needing to go back and defend her land from her mean uncle. Her brother is brought to the school one day and they are able to form a family again, although their father has been killed by the Taliban. Her brother too has seen many unspeakable things while being forced to fight with the Taliban. The only thing they have is each other, their heritage, and their honor and much to the disappointment of Nusrat, decide they much go back to their village and rebuild. I didn't think the writing was great, but you have to keep in mind that it was written for school age children (grades 5-10 generally it seems) to read. It was quick easy read. The story seemed to end a little abruptly and you never find out exactly what happened to them. It would have been nice to have a paragraph or two telling us that they got back to their village safely and it was all peaches, or persimmon's rather, and that Nusrat was back in the states teaching or decided to stay and help Najmah . . .something. Although this story is fictional with made up characters and places, it really tugged on my heartstrings. I know there are people all over the world who are suffering and go through more crap in a month then I will in my lifetime. I am sure there are many people in Afghanistan, and all over the world, who have had very similar things happen to them and their families. When I’m having a bad day or I'm in a bad mood and I may think the world is against me, I need to realize that my worst day won't be even close to what people in these regions go through every day. I cannot fathom what it would be like and am thankful for everything that I have. I need to read more books like this every once in a while to keep me grounded.